Each year since 1964, a prominent poet has been invited to give a reading at the University of Connecticut as part of the Wallace Stevens Poetry Program. A student poetry contest is held in conjunction with that program. First, second, and third place cash prizes are awarded. Prize winners read from their work at the annual program, and winning poems will be published in the Long River Review. Undergraduate and graduate students from the University of Connecticut’s main and regional campuses, except previous first place winners. Submit a single MS Word document containing the cover sheet followed by 5-8 pages of poems (cleanly typed, only one poem per page). This can be up to eight short poems, or several longer pieces. Please submit your work via e-mail following these guidelines. The subject line of the email must indicate the full name of the contest. Note that while your student ID number should appear on every page, your name should appear only on the cover sheet. Students may submit one poem or an excerpt from a longer prose piece (maximum 1,500 words) translated into English, along with the original language version. The submission should consist of one Word document attachment: your cover sheet and your translated piece including the original language version. Prizes: Varies Annually. The 2017–2018 awards were $2,000 each. Awarded in memory of Edward R. and Frances S. Collins for the best undergraduate literary works. Two cash prizes are awarded, one in prose and one in poetry. Prize-winning works will be published in the Long River Review. Undergraduate students at the University of Connecticut’s main and regional campuses. Please submit your work via e-mail following these guidelines. The subject line must include the full name of the contest and the genre of your submission (for example: “Collins Literary Prizes: poetry or prose”). The submission should consist of a single MS Word document that contains your cover sheet (see format) followed by your submission. (Note that while your student ID number should appear on every page of the packet, your name should appear only on the cover sheet.) Students may submit work in more than one genre but please do so in separate e-mails (in other words, do not include a short story and a poem in the same e-mail). For this prize, please submit each piece individually. Awarded in memory of Jacob and Jennie Hackman for the best works of undergraduate short fiction. Up to three cash prizes awarded. Winning stories will be published in the Long River Review. Please submit your work via e-mail following these guidelines. The subject line must include the name of the contest. The submission should consist of a single MS Word document that contains your cover sheet (see format) followed by your submission. Note that while your student ID number should appear on every page of the packet, your name should appear only on the cover sheet. One prize each for the best graduate and undergraduate works of creative nonfiction will be awarded. Winners will receive a cash prize and will read from their work at an evening program featuring a notable guest author. Undergraduate first place winner’s work will also be published in the Long River Review. Graduate and undergraduate students at the University of Connecticut’s main and regional campuses. Students may submit one unpublished creative nonfiction work. Please submit your work via e-mail following these guidelines. The subject line must include the name of the contest and your student status (for example: “AETNA Creative Nonfiction Awards – undergraduate”). The submission should be a single MS Word document that contains your cover sheet (see format) followed by your submission. Note that while your student ID number should appear on every page of the packet, your name should appear only on the cover sheet. One cash prize awarded for the best piece of creative work in any genre written by a graduate student. The winning piece will be published in the Long River Review. Graduate students from any University of Connecticut department or campus. Graduate students may submit prose pieces of up to 2,500 words, or for poetry, 1-3 poems. Please submit your work via e-mail following these guidelines. The subject line must include the full name of the contest and the genre of your submission (for example: “Long River Graduate Writing Award – poetry”). The submission should consist of a single MS Word document that contains your cover sheet (see format) followed by the submission. Note that while your student ID number should appear on every page of the packet, your name should appear only on the cover sheet. The winning piece will be published in Long River Review. Graduate and Undergraduate students from any University of Connecticut department or campus. Please indicate whether you are submitting a manuscript for a picture book, a sample of children’s poetry or drama, or an excerpt from a middle-grade chapter book or a young adult novel. Limit of 3,000 words. Submit your work via e-mail following these guidelines. The subject line must include the full name of the contest and the genre of your submission (for example: “Collins Literary Prizes: poetry or prose”). The submission should consist of a single MS Word document that contains your cover sheet (see format) followed by the piece that you are submitting. Note that while your student ID number should appear on every page of the packet, your name should appear only on the cover sheet. Wednesday, November 14 — Glen MacLeod, UConn Professor of English at Waterbury, will speak on “Wallace Stevens and Surrealism.” The lecture will draw on the major Surrealist exhibition at the Wadsworth Atheneum, “Monsters and Myths: Surrealism and War in the 1930s and 1940s” (October 20, 2018 – January 19, 2019). Stevens’s first book, Harmonium (1923), records the spirit of New York Dada, a precursor of Surrealism. During the 1930s he developed a new kind of poetry, partly in response to the full range of Surrealist art that he saw at the Wadsworth Atheneum, then the most modern museum in the United States. His breakthrough poem, “The Man with the Blue Guitar” (1937), was inspired by Picasso’s Surrealist period. 3:00 p.m. in the Hartford Times Building, Room 145. Sponsored by the Creative Writing Program and the UConn Bookstore. Leigh Grossman is a writer, college lecturer, editor, and publishing consultant. He teaches in the English Department at the University of Connecticut and does typesetting, book development, and book production for various publishers and authors via his company, Swordsmith Productions. Grossman is the author of sixteen published books, most recently fantasy novel The Lost Daughters. He compiled and edited Sense of Wonder, the largest single-volume science fiction anthology ever produced. Previously, he was a production supervisor at Avon Books, an editor at Byron Preiss Visual Publications/Multimedia, a college-level history and writing instructor, and a reviewer for several genre magazines. He lives in northeast Connecticut with his wife and young daughter, where he serves as an elected member of two town boards. Grossman’s writing credits include fantasy novels The Green Lion and The Golden Thorns; nonfiction works The Red Sox Fan Handbook, The Adult Student’s Guide, and The New England Museum Guide; along with several other books, and he was the original review editor for Horror magazine (where he primarily reviewed dark fantasy). He went on to write reviews for Wavelengths and Absolute Magnitude. This event will take place in Austin 217 at 2:30 pm on November 14. Sarah Winter is the author of The Pleasures of Memory: Learning to Read with Charles Dickens (Fordham UP, 2011) andFreud and the Institution of Psychoanalytic Knowledge (Stanford UP, 1999). 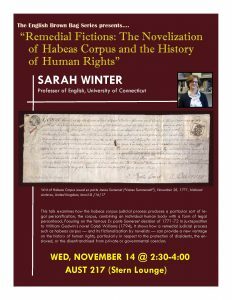 In Spring semester 2012, she held the UConn Human Rights Institute Faculty Fellowship to work on a book project titled “A Test of Sovereignty: The Novel, Habeas Corpus, and Human Rights.” This project examines personifications of the political prisoner and the fugitive slave in Anglo-American habeas corpus jurisprudence, abolitionist writings, and the novel, in order to trace the formulation of modern legal conceptions of human rights in the long nineteenth century. Her articles have appeared in journals such as Victorian Studies, Novel: A Forum on Fiction, Cultural Critique, and Comparative Literature Studies, and she won the North American Victorian Studies Association’s Donald Gray Prize for the best article in Victorian studies from 2009 for “Darwin’s Saussure: Biosemiotics and Race in Expression,” published in Representations. Her recent teaching includes courses in Victorian literature, classical rhetoric, the modern novel, and literature and human rights. Recent lectures include invited talks at the University of Zürich and the University of Cologne, and panel presentations at conferences organized by the Society for Novel Studies, the North American Victorian Studies Association, the American Comparative Literature Association, and the Dickens Project at the University of California, Santa Cruz. 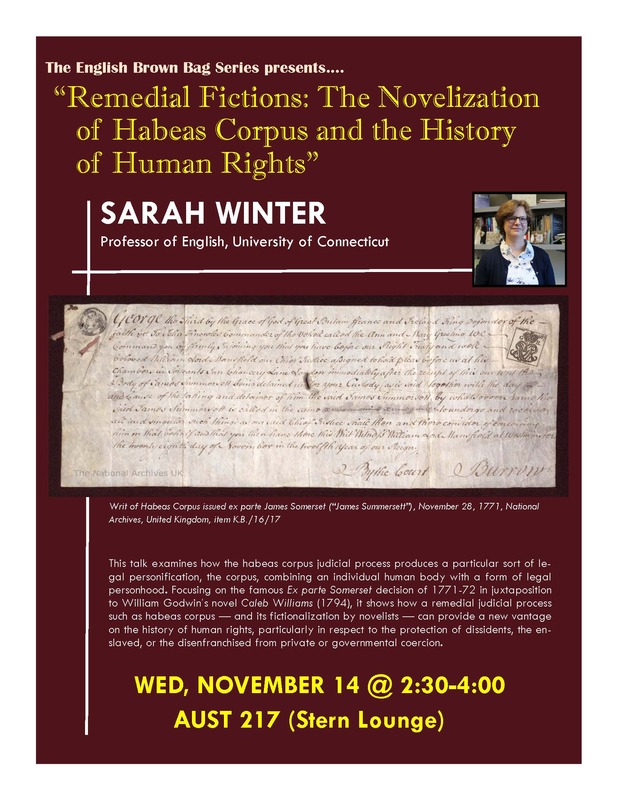 She is also Co-Director of the Graduate Program in Comparative Literary and Cultural Studies and organizer of the faculty study group on Refugees, Narratives, and Media for the Research Program on Humanitarianism at the UConn Human Rights Institute. Irish poet Mary Madec is a graduate of NUI Galway and the University of Pennsylvania, where she was awarded her doctorate in Linguistics. In 2008 she was the recipient of Ireland’s prestigious Hennessy XO Award for Emerging Poetry. She has published two volumes with Salmon Poetry Press, In Other Words (2010) and Demeter Does Not Remember (2014). She is current Director of the Villanova University Study Abroad Program in Galway.